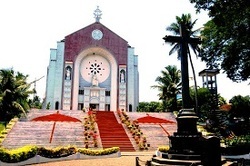 St. Thomas Church at Pala in Kottayam district is known for Rakkuli festival commemorating the Epiphany feast celebrated on January 6. The festival has become an occasion for trade related exhibitions. The festival symbolizes the Biblical account of the three Wiseman from East who left for Bethlehem to adore infant Jesus. The feast of St. Dominic's Church at Aluva falls on the third Sunday after the Easter. The statue of the saint is taken out in procession on the day. The feast of "Our Lady of the Holy Rosary" also consists of the spectacular procession on the Sunday after 8th of December. The procession route will be canopied with festoons, paper flowers, baskets and balloons. St. Mary's Church, Manarcaud is one of the outstanding churches of the Syrian Jacobite Church of Kerala. The most important festival here is the eight-day fast in honour of St. Mary, starting on September 1. Holy Mass is offered on the feast days. On the concluding days, colourful processions are held. The first mosque in India. Situated in Methala, Kodungalloor, hardly 20 kilometer from the Irinjalakuda railway station. It IS India’s oldest mosque and world’s 2nd mosque built in 629 AD soon after Medina Mosque in Saudi Arabia. Legend says King Cheraman Perumal of Kodungallor left for Mecca, embraced Islam, accepted the name Thajudee, married the sister of the then King of Jeddah. Before his death Thajuddeen handed over to the King of Jeddah several letters addressed to Kerala Kings seeking their help to propagate Islam. The Jiddah king came to Kerala and met the king of Kodungalloor who helped the former convert Arathali temple into a Juma Masjid. This mosque was designed and constructed based on Hindu art and architecture. The important legacy of this mosque, is its effective harmony with Hinduism and adoption of several Hindu customs into its system. The Royal Lamp used by Cheras are still used inside the mosque and one of the most important highlight. It was built in 629 A.D. and resembles a temple in appearance. 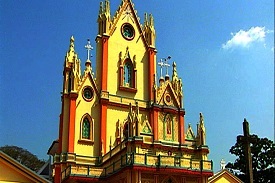 It is situated in Kodungaloor. A white block of Marble blessed by Prophet Mohammed brought here from Makkah. Unlike other mosques which normally faces westwards towards Makkah, this mosque faces towards East. Mortal remains of Uthman Auliya, a revered man in Muslim Community here, is entombed here. Prayers are held in this mosque on Fridays. Annual festival is held in January-February. During the festival a grand processions bringing ceremoniously various articles such as rice, coconut, etc to the mosque as offerings is held. Next day, a grand feast is held for the poor. Located in heart of Trivandrum, is the principal mosque of Trivandrum. It is a Juma Masjid (Friday Mosque). The Mosque is one of the largest in Kerala and famous for its regular sermons. 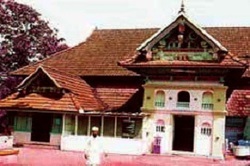 The mosque was established with patronage of Travancore Kings. The Jama-at mosque is important for Kerala's Muslims. The annual Nercha festival of the mosque is celebrated for four days in April. Adjoining the mosque is a mausoleum of the Malappuram Shaheeds whose brave exploits have been immortalised in Mappilla Ballads. It was built under the directions of the Hindu Prana Nambi family. The mighty family had once usurped the properties of Muslims by sheer muscle power. The tears of many affected Muslims had an adverse effect on the Nambi family, resulting in incurable illness to them. To get rid of the trauma they were advised to build a Mosque as repentance. The Malappuram Jamat Mosque is the result of it. 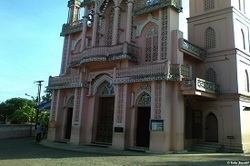 On the way to Malappuram, 18 km east of Manjeri, is Kondotti a prominent pilgrim centre for Muslims. The Mughal style architectured Mosque has a lovely white dome and intricate filigree work The Valia Nercha festival at the 500 year old Pazhayangadi Mosque, celebrated for three days in February-march, draw large number of devotees. The mosque look highly attractive because of the coconut palms in the distance. 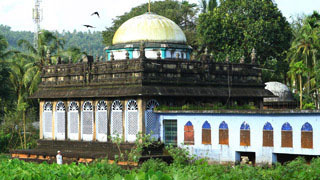 Malik Dinar Mosque is a historical mosque in Kasargod district believed to have been founded by Malik Ibn Dinar. The architecture of the mosque is beautiful and it is a very well maintained mosque. The body of Ibn Dinar was buried within the Mosque.annually festival is celebrated to commemorate the arrival of Malik Dinar in Kasargod.